Note: This is part of a set. 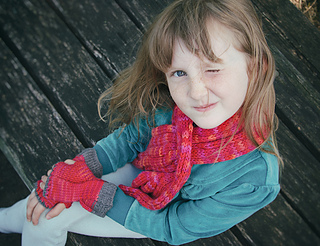 The pattern also includes the Wiggly neckwarmer. 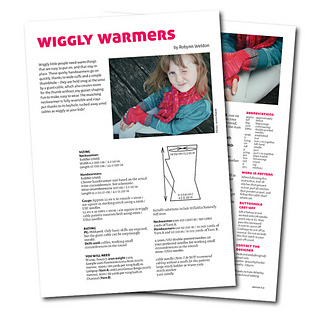 Wiggly little people need warm things that are easy to put on, and that stay in place. 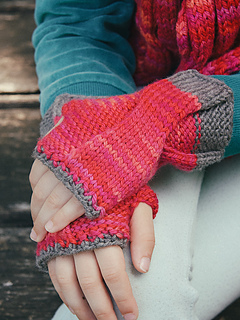 These quirky handwarmers go on quickly, thanks to wide cuffs and a simple thumbhole – they are held snug at the wrist by a giant cable, which also creates room for the thumb without any gusset shaping. Fun to make, easy to wear. 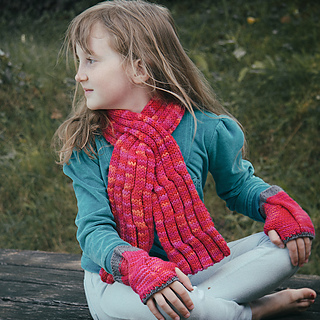 The matching neckwarmer (included in this pattern) is fully reversible and stays put thanks to its keyhole, tucked away amid cables as wiggly as your kids! 50 (55) m / 55 (60) yards of Main Colour and 10 (11) m / 11 (12) yards of Contrast Colour. PG: Mild peril. Only basic skills are required (no increasing or decreasing! ), but the giant cable can be surprisingly sneaky. Skills used: cables, working small circumferences in the round. Note: I do NOT recommend cabling without a needle for this pattern.